Gumbo Bottoms: Pull the Packet to the Shore, and Go Aboard! I've been a fan of Cathy Barton and Dave Para for years. Along with the late Bob Dyer and other musicians from the Boonville/Columbia area, they've spent their careers making Missouri music -- a bit of history, a bit of folklore, a bit of traditional acoustical tunes with modern interpretive lyrics. They're storytellers and musicians who play schools and smaller venues, entertaining a regional crowd. 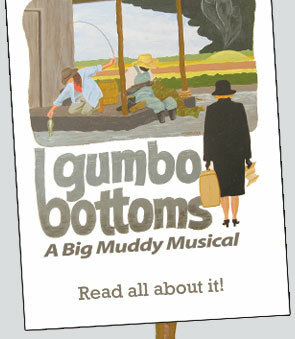 When the email arrived from Dave about Gumbo Bottoms: A Big Muddy Musical coming to St. Francis Borgia Theater in Washington, Mo., and found out Cathy had written the songs, I said, "Yep. Gotta go." The plot involves a newly made widow from the East whose husband lost her fortune, and who inherits a plot of Missouri River bottomland as her only salvation after he dies. All alone in the world, she comes to some undetermined part of rural Missouri river bottom and runs into a number of Missouri folk characters, some aiming to skin her, and others to save her. Meredith Ludwig had the idea. Barton's songs and choreography by Lesley Oswald bring it to life. Barton and Para are half the pit musicians, aided by Kevin Hennessy on bass and Thomas Verdot on (well, they say violin), but it really is fiddle -- the musician's pit is an old-time string band. The set is scant and multipurpose: much of the scenery occurs in the audience's mind, aided by creative lights and sound. Six players comprise the cast: Amy Humphrey as main character Vivian Marks, then in no particular order: Tanjie Hoover as Woman, Josh Kluck as Man & Gus, Steve Jones as Jacques Jeanrue, Willie Cogshell as Gabe Burns, and Deb Jewett as Lucy Taylor. Two white guys, (one of them faux French), a part Indian woman, a black man -- for a moment the echo to that other epic of the Missouri River," A Most Perfect Harmony," hovered above the stage and I looked for the dog, but there were too many women in this cast. The play is lively, the music excellent. It's a farce with several messages; none too heavily presented. There is a feel of showboat packet melodrama about it -- a couple of hours of light entertainment, escapist in the best sense. In the end, the good guys win, though the trip to that conclusion is by no means predictable. Best of all, although the play is very professionally done, there is a sense that the players are doing this because they want to -- the enthusiasm of kids putting on a play in the back yard, not of schooled actors bored with the performance. Yes, the play is a little corny in the best Midwestern sense. But it's original, engaging and deserves a wider audience than it probably will get in these way too sophisticated modern times. If the packet carrying the play pulls up to a landing near you -- go.